Sandmeyer Steel Company stocks the only full line of 2507 duplex plate in North America with plates in thicknesses from 3/16" (4.8mm) through 3" (76.2mm). Alloy 2507 duplex is a cost-effective alloy vs. 904L or 6% moly super austenitic stainless steels. Alloy 2507 (UNS S32750) is a super duplex stainless steel with 25% chromium, 4% molybdenum, and 7% nickel designed for demanding applications which require exceptional strength and corrosion resistance, such as chemical process, petrochemical, and seawater equipment. The steel has excellent resistance to chloride stress corrosion cracking, high thermal conductivity, and a low coefficient of thermal expansion. The high chromium, molybdenum, and nitrogen levels provide excellent resistance to pitting, crevice, and general corrosion. Alloy 2507 is a super duplex stainless steel with 25% chromium, 4% molybdenum, and 7% nickel designed for demanding applications which require exceptional strength and corrosion resistance, such as chemical process, petrochemical, and seawater equipment. The steel has excellent resistance to chloride stress corrosion cracking, high thermal conductivity and a low coefficient of thermal expansion. The high chromium, molybdenum, and nitrogen levels provide excellent resistance to pitting, crevice, and general corrosion. The impact strength is also high. Alloy 2507 is not recommended for applications which require long exposures to temperatures above 570°F because of the risk of a reduction in toughness. The high chromium and molybdenum content of 2507 makes it extremely resistant to uniform corrosion by organic acids like formic and acetic acid. 2507 also provides excellent resistance to inorganic acids, especially those containing chlorides. In dilute sulfuric acid contaminated with chloride ions, 2507 has better corrosion resistance than 904L, which is a highly alloyed austenitic steel grade specially designed to resist pure sulfuric acid. Stainless steel of type 316L (2.5%Mo) cannot be used in hydrochloric acid due to the risk of localized and uniform corrosion. However, 2507 can be used in dilute hydrochloric acid. Pitting need not be a risk in the zone below the borderline in this figure, but crevices must be avoided. 2507's low carbon content greatly lowers the risk of carbide precipitation at the grain boundaries during heat treatment; therefore, the alloy is highly resistant to carbide-related intergranular corrosion. The duplex structure of 2507 provides excellent resistance to chloride stress corrosion cracking (SCC). Because of its higher alloy content, 2507 is superior to 2205 in corrosion resistance and strength. 2507 is especially useful in offshore oil and gas applications and in wells with either naturally high brine levels or where brine has been injected to enhance recovery. Different testing methods can be used to establish the pitting resistance of steels in chloride-containing solutions. The data above were measured by an electrochemical technique based on ASTM G 61. 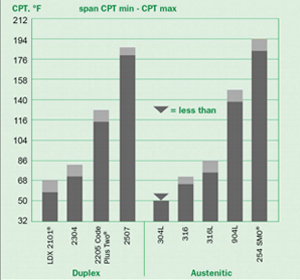 The critical pitting temperatures (CPT) of several high-performance steels in a 1M sodium chloride solution were determined. The results illustrate the excellent resistance of 2507 to pitting corrosion. The normal data spread for each grade is indicated by the dark gray portion of the bar. The presence of crevices, almost unavoidable in practical constructions and operations, makes stainless steels more susceptable to corrosion in chloride enviroments. 2507 is highly resistant to crevice corrosion. The critical crevice corrosion temperatures of 2507 and several other high-performance stainless steels are shown above. 2507 combines high tensile and impact strength with a low coefficient of thermal expansion and high thermal conductivity. These properties are suitable for many structural and mechanical components. 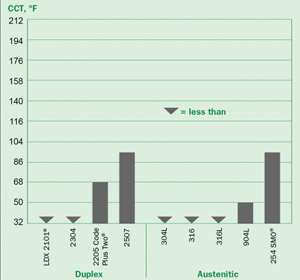 The low, ambient, and elevated temperature mechanical properties of 2507 sheet and plate are shown below. All of the test data shown are for samples in the annealed and quenched condition. 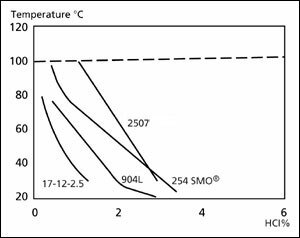 2507 is not recommended for applications which require long exposures to temperatures in excess of 570°F because of the increased risk of a reduction in toughness. The data listed here are typical for wrought products and should not be regarded as a maximum or minimum value unless specifically stated. 0.2% Offset Yield Strength, ksi 80 min. Ultimate Tensile Strength, ksi 116 min. 1% Offset Yield Strength, ksi 91 min. Elongation in 2 inches, % 15 min. Impact Energy, ft-lbs 74 min. Values obtained for hot rolled plates (th ≤ 2"). Alloy 2304 must not be used for a long time at temperatures higher than 300°C (572°F), where precipitation hardening phenomenon occurs. 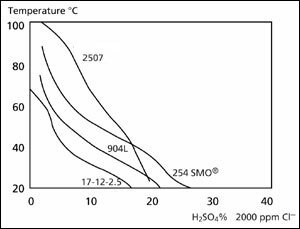 2507 should be hot worked between 1875°F and 2250°F. This should be followed by a solution anneal at 1925°F minimum and a rapid air or water quench. Most of the common stainless steel forming methods can be used for cold working 2507. The alloy has a higher yield strength and lower ductility than the austenitic steels so fabricators may find that higher forming forces, increased radius of bending, and increased allowance for springback are necessary. Deep drawing, stretch forming, and similar processes are more difficult to perform on 2507 than on an austenitic stainless steel. 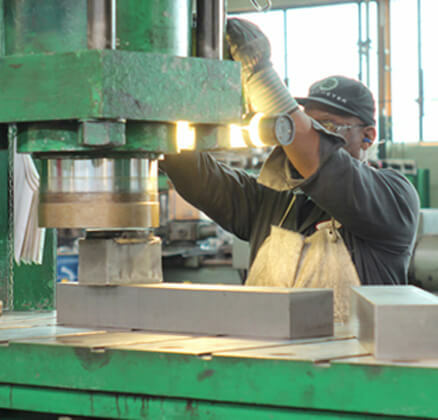 When forming requires more than 10% cold deformation, a solution anneal and quench are recommended. 2507 should be solution annealed and quenched after either hot or cold forming. Solution annealing should be done at a minimum of 1925°F. Annealing should be followed immediately by a rapid air or water quench. To obtain maximum corrosion resistance, heat treated products should be pickled and rinsed. 2507 possesses good weldability and can be joined to itself or other materials by shielded metal arc welding (SMAW), gas tungsten arc welding (GTAW), plasma arc welding (PAW), flux cored wire (FCW), or submerged arc welding (SAW). 2507/P100 filler metal is suggested when welding 2507 because it will produce the appropriate duplex weld structure. Preheating of 2507 is not necessary except to prevent condensation on cold metal. The interpass weld temperature should not exceed 300°F or the weld integrity can be adversely affected. The root should be shielded with argon or 90% N2/10% H2 purging gas for maximum corrosion resistance. The latter provides better corrosion resistance. If welding is to be done on only one surface and post-weld cleaning is not possible, GTAW is suggested for root passes. GTAW or PAW should not be done without a filler metal unless post-weld cleanup is possible. A heat input of 5-38 kJ/in. should be used for SMAW or GTAW. A heat input of about 50kJ/in. can be used for SAW. NOTE: 2205 Code Plus Two and 254 SMO are registered trademarks of Outokumpu Stainless, Inc. The information and data in this product data sheet are accurate to the best of our knowledge and belief, but are intended for informational purposes only, and may be revised at any time without notice. Applications suggested for the materials are described only to help readers make their own evaluations and decisions, and are neither guarantees nor to be construed as express or implied warranties of suitability for these or other applications.